The answer is my absolute favorite character trait of God. Romans 8:28 states: “And we know that for those who love God, all things work together for good.” God used Mark’s fall for an amazing purpose. Not only did He create an amazing young man of God in Mark, but God shaped an entire family. Through Mark’s journey, God has affected so many others by showing His faithfulness. It remains a big challenge for our family each time Mark takes another step towards independence. It was an enormous act of faith when my parents decided to allow Mark to go on this winter retreat at Black Rock. God couldn’t have picked a better place for Mark’s next step. My family lives about a mile away from Black Rock and we have known Josh Foley (the Summer Camp/Winter Camp Director) since Mark had his accident. I was incredibly proud of my parents’ faith to allow Mark to go, but I didn’t realize how challenging it would be for me as a youth leader on the trip to trust as well. As soon as Mark and I arrived, he met his first trial. Since it was winter camp, the path to our cabin was very icy. Mark has absolutely terrible balance (no offense, Mark) and I knew he was going to fall multiple times this weekend. I could picture my Mom if she was there saying something like, “Welp! We tried it but this place is not safe! We’re going home, Mark, maybe next year.” But Mom wasn’t there to protect Mark this time, it was just me. I told him, “you are going to fall, but you’ll be alright. We can make it across.” And we did! Mark ended up falling only twice that weekend which was a miracle in itself! 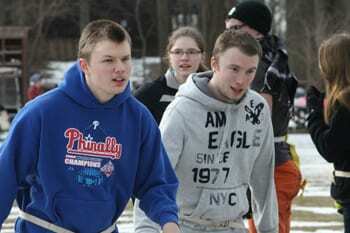 Mark made it through his weekend away at Black Rock’s Winter Camp because God was in control the whole time. He let Mark fall on the ice because He knew there would be people to lift him back up. He let him stray because He knew that Mark would be led back. And yes, God let him go through the accident when he was two because He knew what he would become. At nineteen years old, Mark has been homecoming King, he works part time at a greenhouse, he serves at Celebrate Recovery weekly and leaves everyone he comes in contact with a little more joy. Oh yeah, and Mark recommitted his life to Christ at Winter Camp that weekend. Not because anyone told him he should, not because he saw his brother doing it, but because God called upon and he answered, because God has Mark.